Female acts, rap songs win big at the Grammy Awards. Los Angeles: Women and rap triumphed at the Grammys on Sunday as female acts took home top prizes including album of the year and best new artist, and Childish Gambino made history when his hit "This Is America" became the first rap-based track to win record and song of the year. Kacey Musgraves' country-pop release “Golden Hour" won album of the year, and British singer Dua Lipa won best new artist, a year after female voices were somewhat muted at the 2018 ceremony and the Grammys were criticised for the low number of female nominees. Six women were nominated for best new artist and five of the eight album-of-the-year nominees were women, including Brandi Carlile, who described herself as "a kid from the '90s from Lilith Fair." "Tonight gives me hope as a mother of two young daughters," said Carlile, who won three honours in the Americana category and was the most nominated women with six. Musgraves and Gambino were the night's top winners, taking home four awards each. "This Is America" also won best music video and best rap/sung performance. "Look, if there are people who have regular jobs who are coming out in the rain and the snow, spending their hard-earned money to buy tickets to come to your shows, you don't need this right here. I promise you. You already won," said Drake, who won best rap song for “God's Plan." 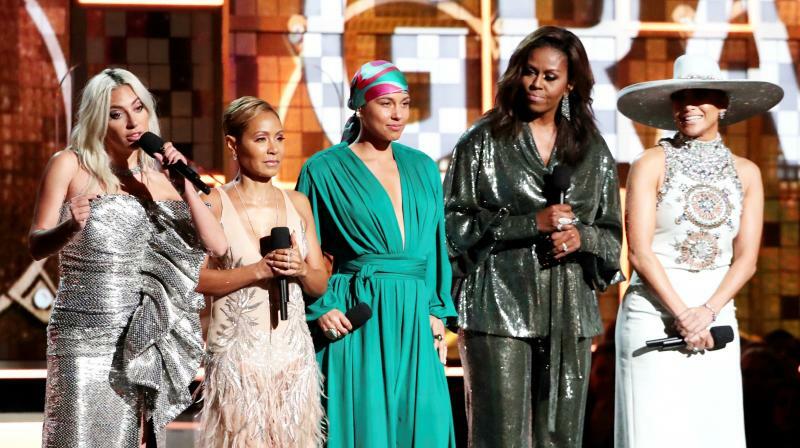 The Grammys kicked off with a group of powerful women, including Michelle Obama, describing the role of music in their lives. “Music has always helped me tell my story," said Obama, who surprised the audience with her appearance. "Whether we like country or rap or rock, music helps us share ourselves. It allows us to hear one another." Lady Gaga, Jada Pinkett Smith and Jennifer Lopez also spoke and stood in solidary with Obama, Gaga and Alicia Keys, who hosted the show. "Yes, ladies," Keys said. "There's nothing better than this."